Who doesn’t love adorable animals? Perhaps there are Scrooges out there that would contend that question, but if you’re reading this, that person probably isn’t you. 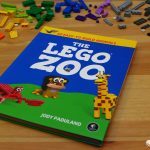 If you want to learn how to build some animals, The LEGO Zoo by Jody Padulano might just be the book you’re looking for. 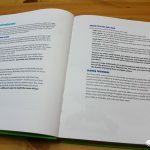 Whether you clicked that link for your own sake, or you think a special kiddo in your life might love this book, we have the answers regarding what to expect. So grab your safari vest and binoculars, and away we go! 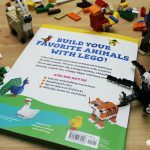 This roughly 200 page book, boasting instructions for 50 different LEGO animals, is half an inch thick and loaded with color. 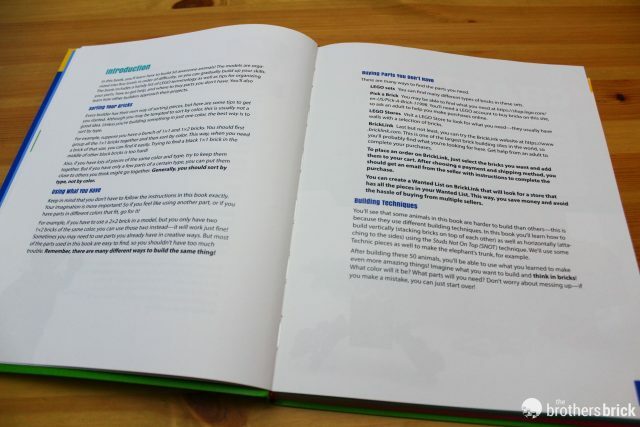 It’s published by No Starch Press and printed on thick, glossy paper. While it’s not a hard-cover, it’s still sturdy and very similar to other related books by the same publisher. This one retails for $19.95 USD, but is currently on sale through Amazon for only $13.36 USD. The majority of this book is relayed in pictures with minimal commentary. 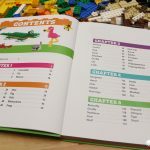 But first, we begin with a list of LEGO terminology, and an introduction with tips on sorting, buying parts, and building techniques. 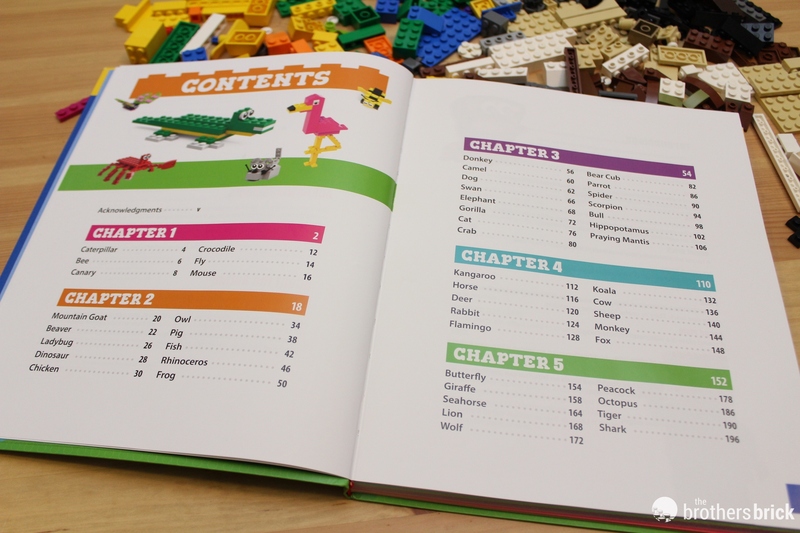 A table of contents at the beginning lists all of the animals that you will make as you journey through the book. The menagerie of instructions are grouped into 5 chapters, each one increasing in difficulty as you work your way through them. 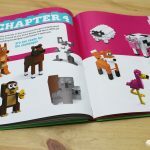 The first chapter contains 6 animals and is meant to be extra easy. 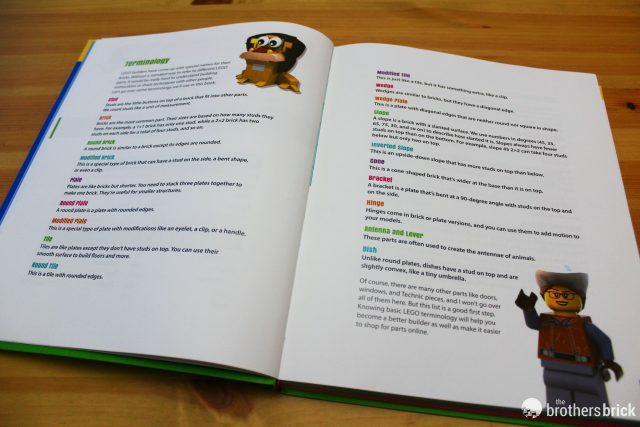 Throughout the book each animal is introduced with a little fact about them. There are also occasional helpful reminders or tips. One of the animals we chose to start with was the crocodile. The feet are a bit fiddly and keep falling off, but it was easy to find the parts and quick to build. 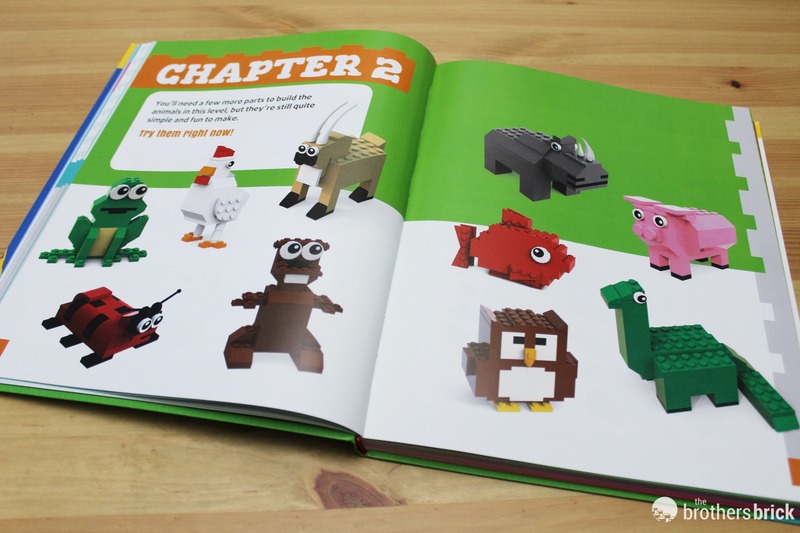 Chapter two features 10 more creatures with substantially more parts. 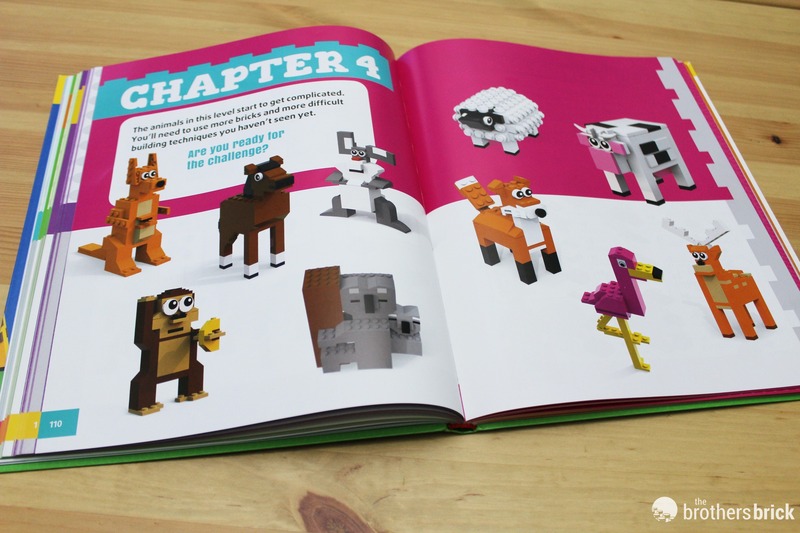 Right away, it’s easy to notice that this group of animals are more blocky than the rest (no pun intended). 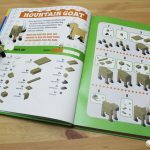 Starting with the Mountain Goat, we jump right into using a side build technique for the face. Several chapters including this one allow for, and even encourage, using entirely different colors or parts to achieve the same result. It’s helpful when you realize you’re struggling to find exact parts. 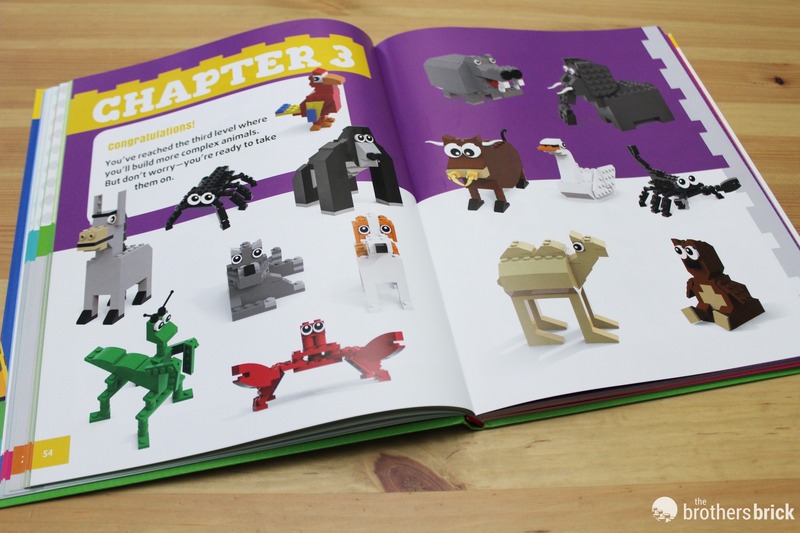 Next we have chapter three, which ups the ante with 15 different animals. These ones are a lot of fun, although the grey cat is a little strange. Laying on its side, it takes a bit of imagination to really see a cat. We like the macaw because it has a bit more color. The scorpion is also cute! Unfortunately, like the crocodile legs, the praying mantis is pretty fragile. We liked the macaw for a little more color, and added different crest to give him more character. 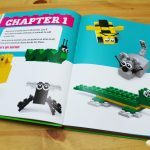 Chapter 4 is a bit of a favorite with 10 great builds. The kangaroo’s “joey” is a little odd looking, but overall these animals are truly adorable. It’s interesting that most of the animals have the round 1×1 printed tile eyes, except for three differences. 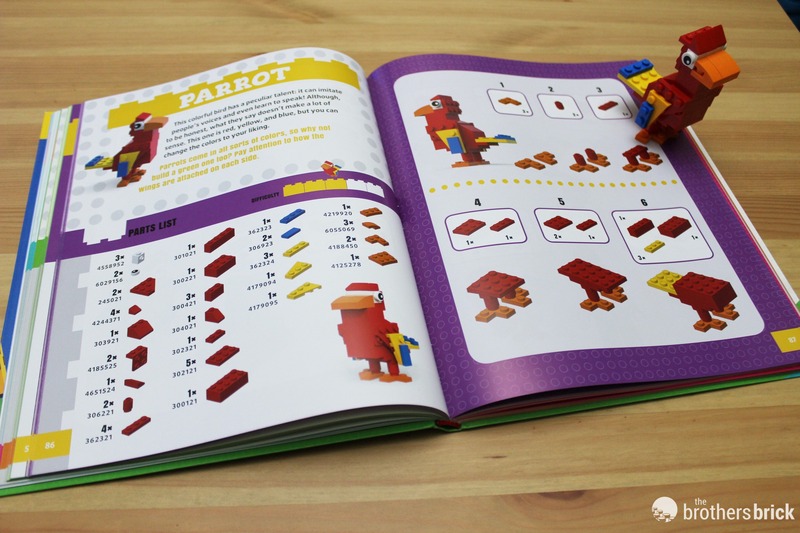 The koala along with the owl from chapter two both have brick-built eyes, and the flamingo has a 1×1 printed brick that hasn’t been seen in a set since 2014. 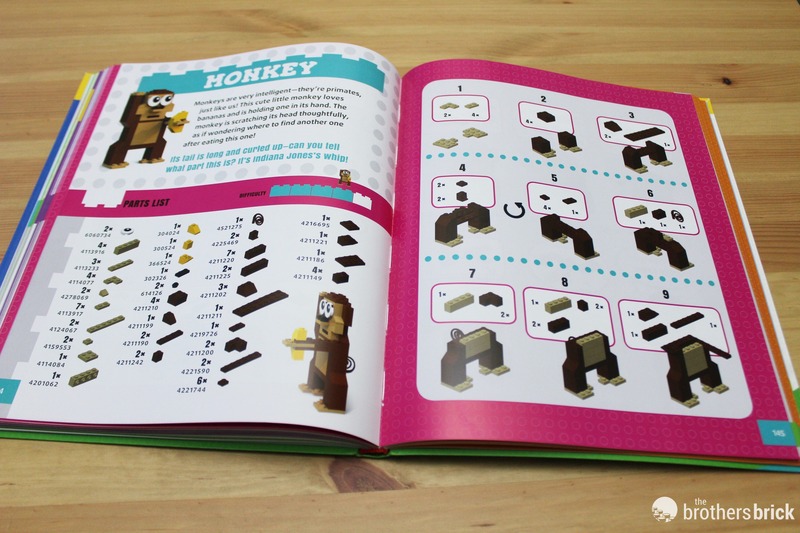 There are at least two errors in the book that we were able to find, both with the monkey. This guy is supposed to have a 1×4 brown plate in its lower belly that was missed in making the instructions. It’s easy to imagine how, as it magically appears after a step where the build is turned around. (Ta da!) The second issue is that the instructions call to place a piece after another piece has already been place in the way. You need to remove a couple parts to put it where it belongs. 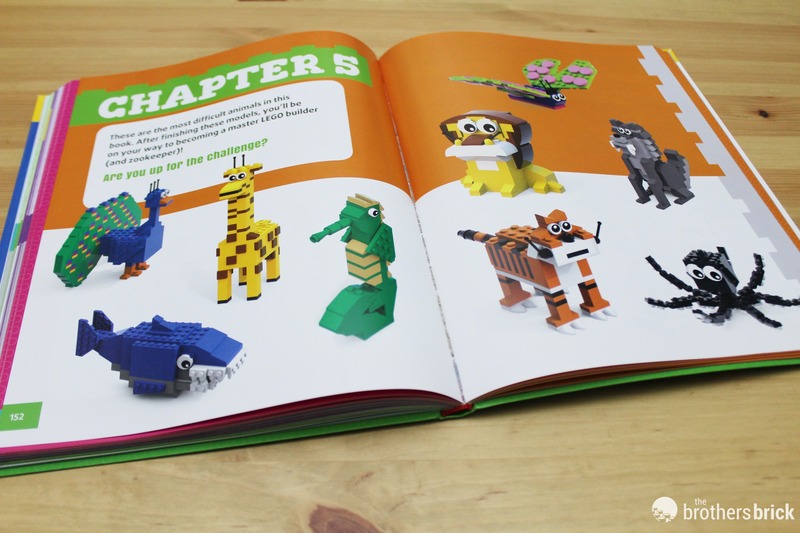 The final chapter of this book is quite colorful with 9 animals, including a vibrant peacock and butterfly. If you have all the parts, this one is a ton of fun to crank out. It also holds a lot of neat techniques and inspiration. 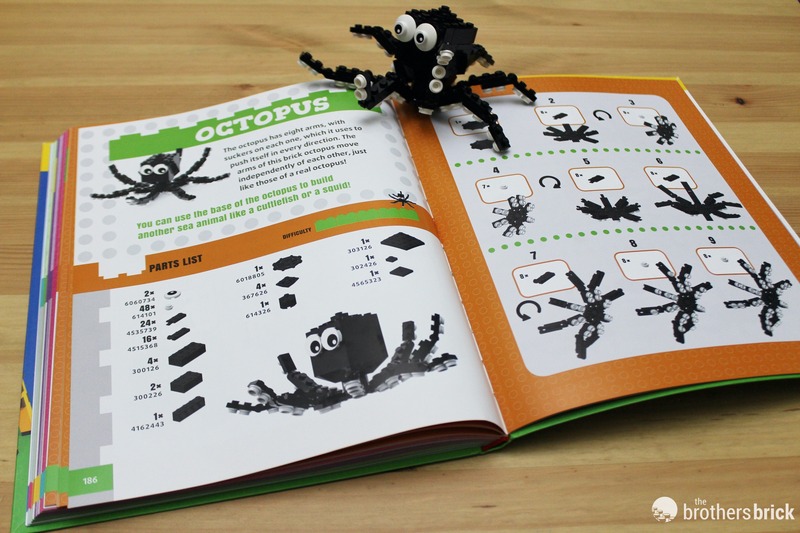 One of the most fun builds in the entire book is the octopus. It would be really easy to make this in several different colors. 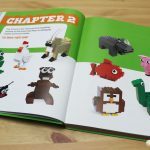 If you look very carefully at this and other animals we made, we decided to stray from the instructions just a little. One reason is that there are just a couple builds that ask for slightly rarer parts than necessary. The octopus calls for a black 2×2 inverted corner slope, which recently has only been in a handful of sets, all large, and alone costs around $0.40 USD a piece. Fortunately all these animals are quite easy to put your own spin on. 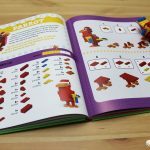 This book has a couple different lessons to teach besides building techniques. 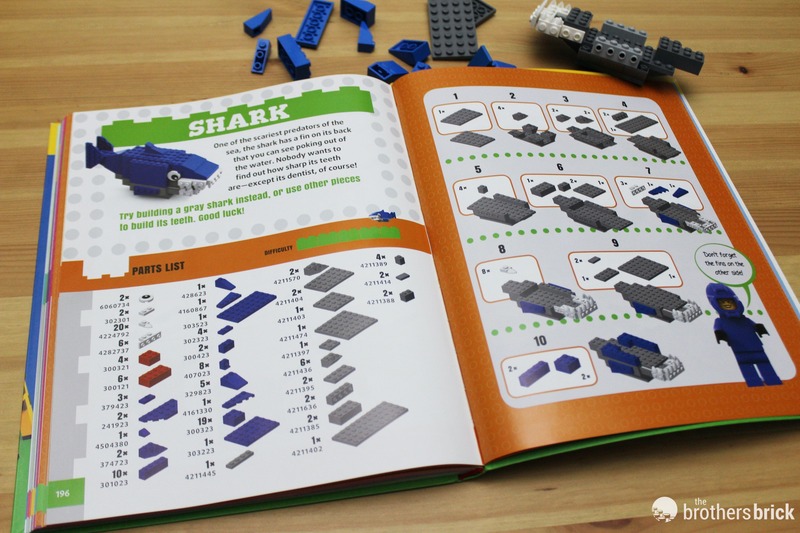 First, if the builder hasn’t noticed already, working through this book is a killer without at least some form of pre-sorted parts. Searching through a giant mixed brick bin for 79 1×1 white round plates would be a nightmare. (Or a wonderful, never-ending Easter egg hunt if you’re a silver linings kind of person.) But that leads to another lesson: it’s a good idea to skim through the instructions before picking out the parts. Nearly every animal includes unnecessary additional pieces. 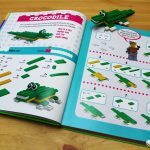 For example, the dinosaur calls for 27 green 2×2 bricks, most of which can be replaced by a few 2x6s. The monkey also asks for 6 1×1 brown plates instead of simply 2 1×1 bricks. The shark suggests 20 1×1 white teeth, but could easily be replaced with 1×2 white teeth. 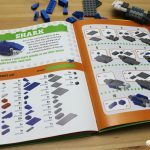 With massive collections ourselves, even we might need to head to Bricklink.com, the LEGO Store, or eBay to find enough of some of these parts. For both adults and kids, it’s a good practice to be open-minded and see these instructions simply as suggestions. If you’re lost or need inspiration, these will definitely help you get started. 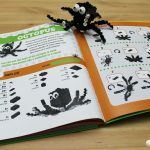 If you intend to purchase this book as a gift, we might recommend accompanying it with a variety of parts to help them get started. Perhaps something like the 10698 Classic Large Creative Brick Box would be a good pairing. In conclusion, this is a fun little book. 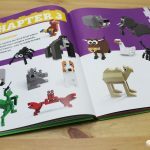 We would have liked to see it demonstrating how to build similar animals using only the parts found in creative boxes such as the one above. Or, at least, that it didn’t suggest using quite so many parts that most people would have to turn elsewhere to purchase them prior to building. 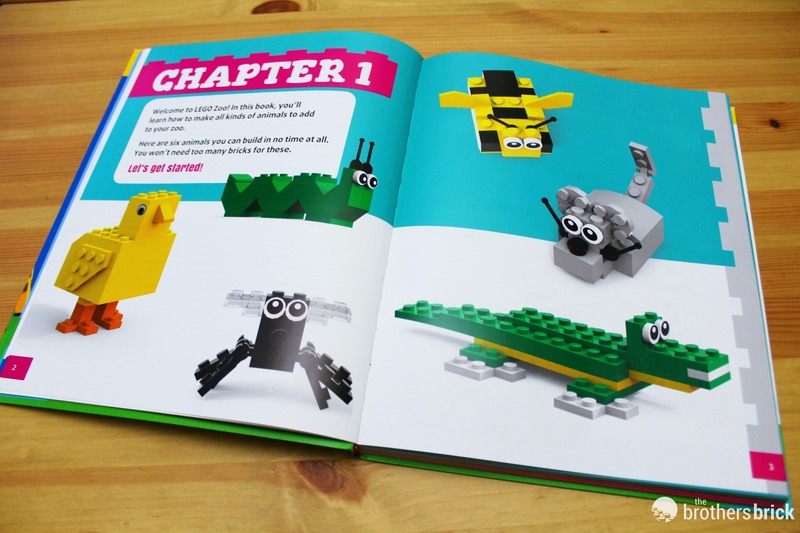 Also, the language in this book is really intended for young builders, rather than grown-ups, but that’s not to say it wouldn’t be fun for adults. 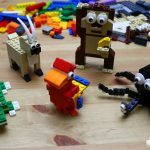 As a gift for kids, it would probably be best to try a couple builds with them, and explain the concept of improvising to reduce frustration. Overall, even with its faults, we would recommend this book as an excellent source of ideas. Thank you to No Starch Press for offering us a copy of this book. Sending us products does not guarantee a positive review. 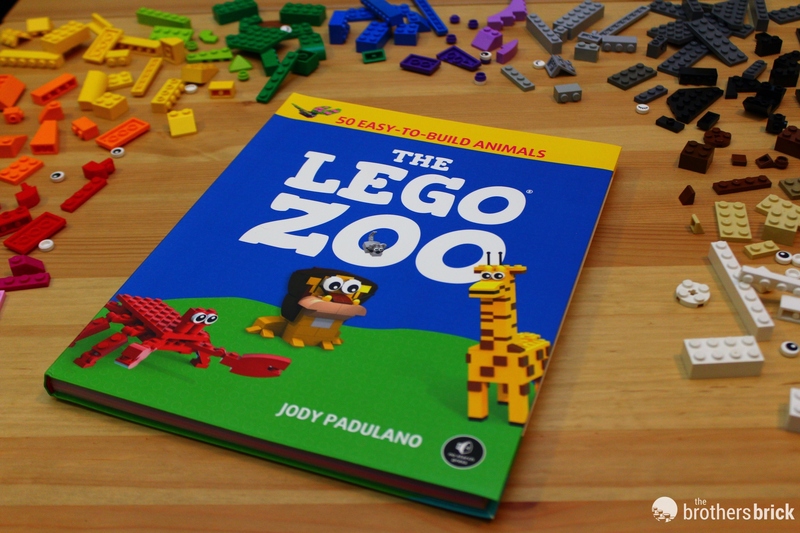 The LEGO Zoo by Jody Padulano is available from No Starch Press for $19.95 USD and Amazon for $13.36 USD in addition to other bookstores. I agree, the octopus would look great in bright colours. Good review. Such a cool looking book! 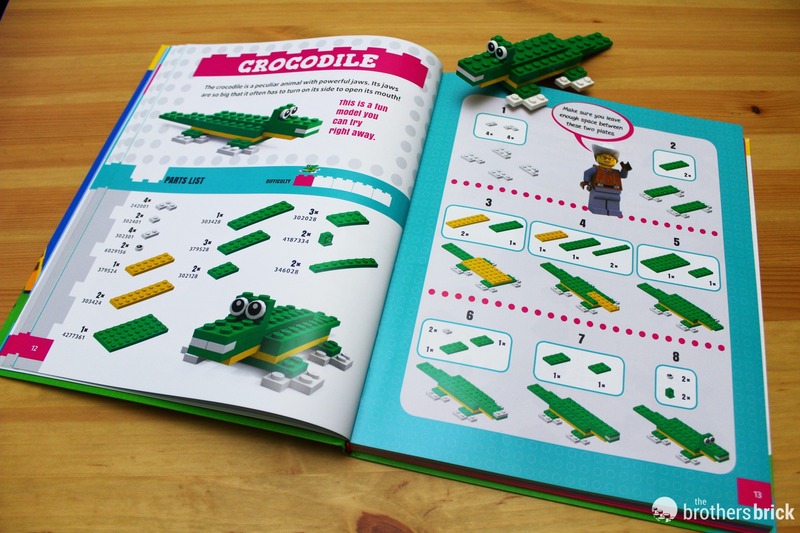 My daughters would love building these. I have just added this book to my Amazon wish list. I like it a lot as it seems to be using much more standard bricks. I look forward to building the models with my daughter. This looks great. 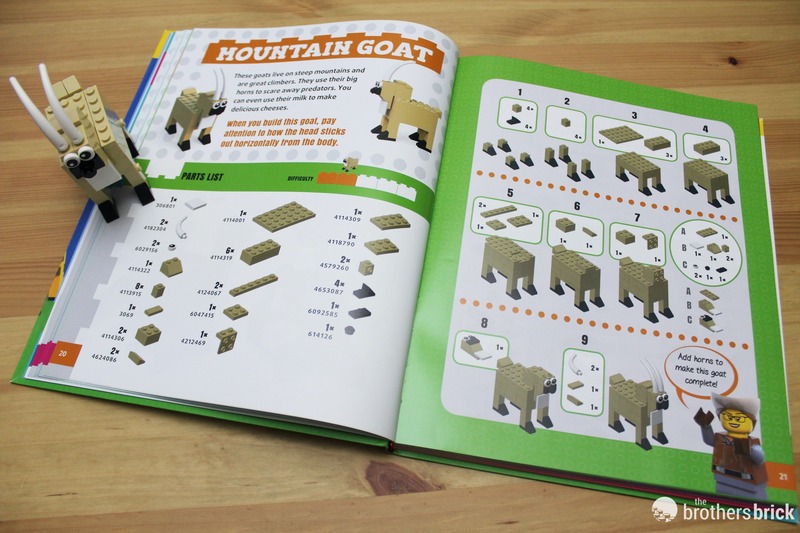 My son would love it as would I.
Wow, this looks like a fun book, especially for building with the kids ?! Love the look of the animals. Super cool! How are the peacock’s feathers built? Count me in for this wonderful book! Fantastic! 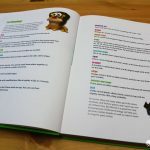 My son would love this book!! I like the idea of showing alternate parts that could be used. One of my favorite builds on my shelf at work is a Chinese dragon based on instructions from a magazine that I improvised with parts on hand. Looks great to me. 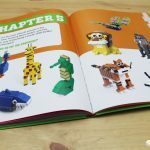 Was intrigued by the giraffe as I am thinking of trying to build Geoffrey the giraffe for old times sake. Maybe as a brickheadz to fill a gap in my collection. Great collection. 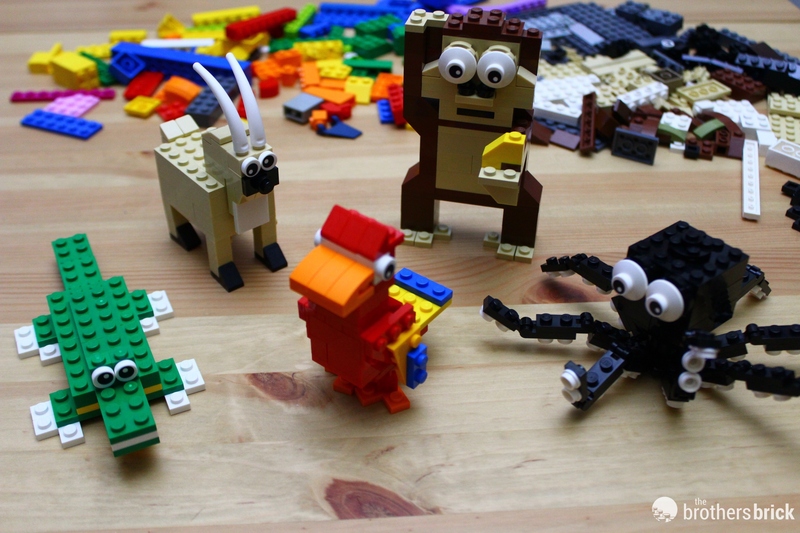 Awesome idea for kids and adult builders. Thanks for the detailed review. Looks like a neat little book. Great review. 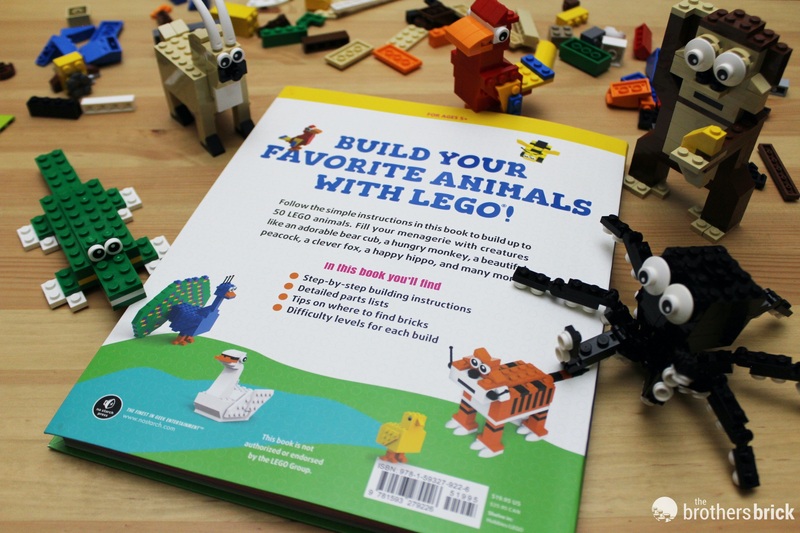 Would love to have this book. Hello! I am Jody Padulano and thanks for reviewing my book! @Jody Padulano, it’s been our pleasure! For the rest of the community – here’s your chance to ask any questions you may have in mind! A nice change of pace from the star wars sets my son is obsessed with.